I work as an SAP Solution Manager consultant. In this blog post, I take the example of Soldoc 7.2 Graphical Editor to explain SAPUI5 index calculation issues, but… long story short: Execute program /UI5/APP_INDEX_CALCULATE after Embedded Search configuration, then schedule jobs to run periodically in your SM 7.2 system! 2016. Solution Manager 7.2 is released and reimagines completely Solution Documentation, as well as the general integration through the concepts of Solution and Branches. The tool is now so much more than a document management system, and offers a fully integrated experience with other SM tools, such as ChaRM, Test Suite and BPMon. It is a web-based experience that comes with reusable libraries based on real usage (Executables/Z* objects), the ability to import preexisting SAP Best Practices, and… a brand new BPMN process editor! The Graphical Editor, in particular, is a powerful innovative feature, both easy to use (because it looks and feels very much like any other popular BPMN editor) and powerful (because elements are integrated and managed by Solution Manager). In other words the single source of truth is more complete than ever. That being said, the SAP SM process modeling tool is not perfect. For example, similarly to Solutions that are not deletable as of 7.2 SP04, you cannot copy SAP-based process diagrams at any level of the hierarchy. You cannot import diagrams from external BPMN editors either. And, unless you are HANA-based, neither the embedded search nor the graphical editor will be available to you. This means you will not be able to search anything in Solution Documentation. This also means you cannot work with the modeling tool at all. First things first, you empty your browser cache. Same error. You now check whether the Embedded Search setup and TREX connection have been setup properly. Everything looks good. 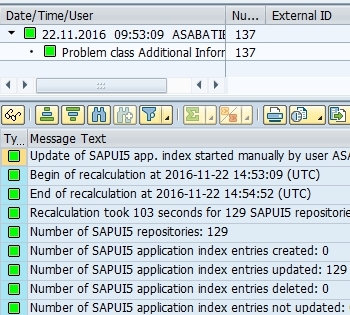 It may take you some time to understand what went wrong: SAPUI5 Application Index. This index provides a “caching mechanism for information related to SAPUI5 applications, components, and libraries that are contained in SAPUI5 repositories on the SAP NetWeaver Application Server for ABAP […] The cached information consists of calculation results related to the back-end support for cache busting on SAPUI5repository level.” Simply put, it is the browser cache for SAPUI5 apps. You can now schedule a weekly job to run it periodically. Full explanation from SAP, as well as the answer to the problem, is available in this SAP HELP article: https://help.sap.com/saphelp_uiaddon10/helpdata/en/c5/e7098474274d3eb7379047ab792f1f/content.htm In conclusion, you should schedule the Index recalculation job for every SAP Solution Manager 7.2 installation. The “editor manager instanation” error for Solution Manager modeling tool is just one example of many potential UI2/UI5 cache errors.